ARK: Survival Evolved is coming to Nintendo Switch, launching on digital and in store this fall 2018, and gave the audience its first look at the game running live on the Switch. Created in conjunction with co-development studio Abstraction Games, the award-winning open-world survival adventure where you can tame dinosaurs, conquer enemies and create enormous structures, now allows you to take your tribe anywhere - at home or on the go. ARK: Survival Evolved on Switch includes the complete contents and features of the original game; from the massive and mysterious ARK island, to the more than 100 prehistoric- and fantasy-inspired creatures such as the T-Rex, Giganotosaurus, Rock Drake and Reaper. Hundreds of hours of exploring, crafting, survival and combat await players as they go it alone, or group up with thousands of other Survivors to explore the island and solve the mysteries of the ARK. 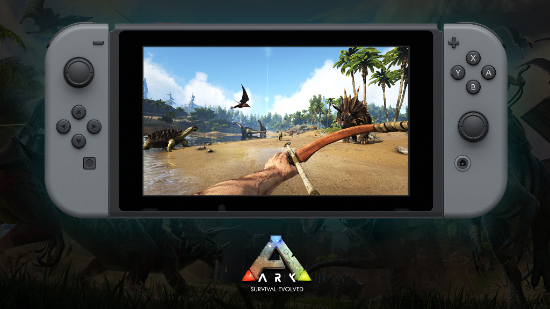 "The Switch’s handheld mode provides a fantastic new capability for survivors who want to fully immerse themselves in the vast worlds of ARK," said Jeremy Stieglitz, Studio Wildcard’s Lead Designer, Lead Programmer, Development Director, and Co-Creative Director. "With this new version, Switch players can go directly from hunting and taming while sitting on the couch, to forming online tribes and searching out new conquests when on the bus, waiting in line, or wherever they happen to be." Studio Wildcard also announced that its partner, War Drum Studios, creators of the ARK: Survival Evolved mobile experience, sent out its first wave of invitations to the Closed Beta for iOS players. GDC 2018 attendees can play ARK mobile in the Epic Games booth No. 801. Prepare for the ultimate dinosaur-themed adventure! Stranded on a mysterious prehistoric island, you must explore its vast biomes as you begin to hunt, harvest, craft tools, grow crops and build shelters to survive. Use cunning and skill to kill, tame, breed, and even ride Dinosaurs and other primitive beasts living on The ARK. Advance your technology from primitive stone tools to T-Rex-mounted laser cannons, as you team up with hundreds of players online or enjoy a solo Jurassic experience. Since ARK: Survival Evolved's launch into Steam’s early access program in June 2015, over 13 Million survivors have been stranded on the ARK island, wandering into an incredible land to discover how to tame, train, ride, and breed the 100+ dinosaurs and primeval creatures roaming the land.